If you have been reading my blog for a while, you will know that one of the things I have done over the last few years is teach a wonderfully enthusiastic group of children. The group started in July 2012 and I have typically run 6-7 classes per year. The goal was to teach the children some basic sewing skills as well as sharing the sheer joy and passion that I have for stitching things by hand. It has been an absolute privilege to work with such a lovely group of children, to witness their joyful creativity, and to see their sewing skills improve so much. We had our last class together on Sunday, so today’s post is dedicated to a celebration of these kids and the wonderful work they have done over the last three years. In the first year, we squeezed sewing classes into one and a half hours after school. It was lots of fun but the pressure was always on to finish projects in such a short time. Nevertheless, the children did an amazing job and attacked every new class with boundless enthusiasm. Our goal became making items for a stall at the school fair. 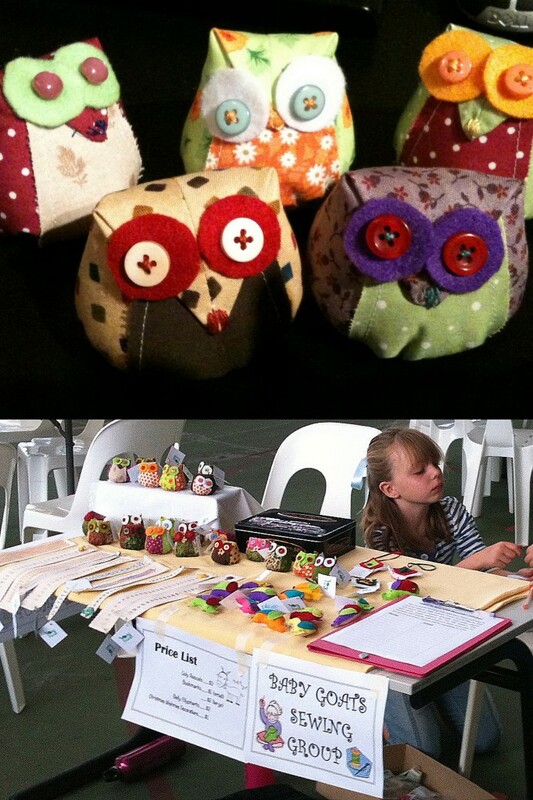 We had so much fun making cute little owls (each one had its own personality), felt elephant brooches, Christmas decorations and colourful bookmarks stitched on Aida cloth. All ready to sell the fruits of our labours in November 2012. In 2013, we moved to a local hall on Sunday afternoons. This proved to be a huge success. Sunday afternoon gave us time to finish projects without feeling so rushed and we had plenty of room to spread out. There was also a lovely seat in a large bay window where the children liked to sit whilst stitching. Extra time and the children’s developing skills allowed us to explore some more challenging projects. 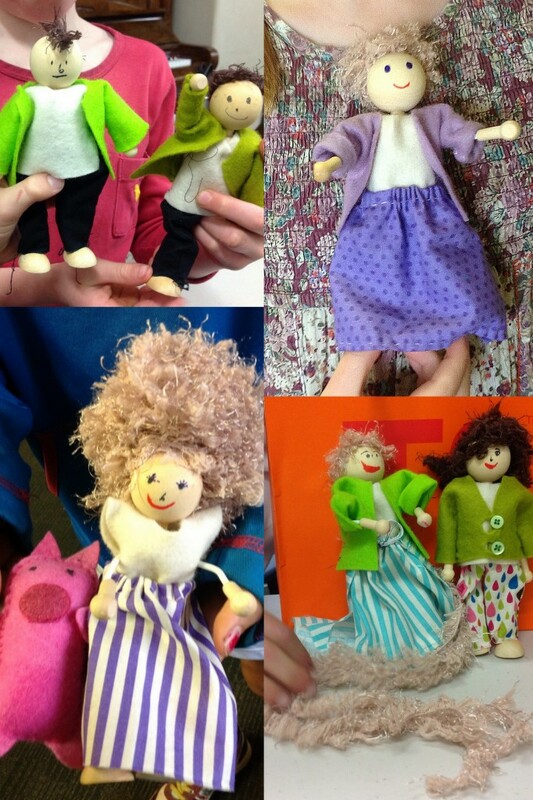 My personal favourites were embroidery hoop pictures and creating clothes for wood and wire dolls. 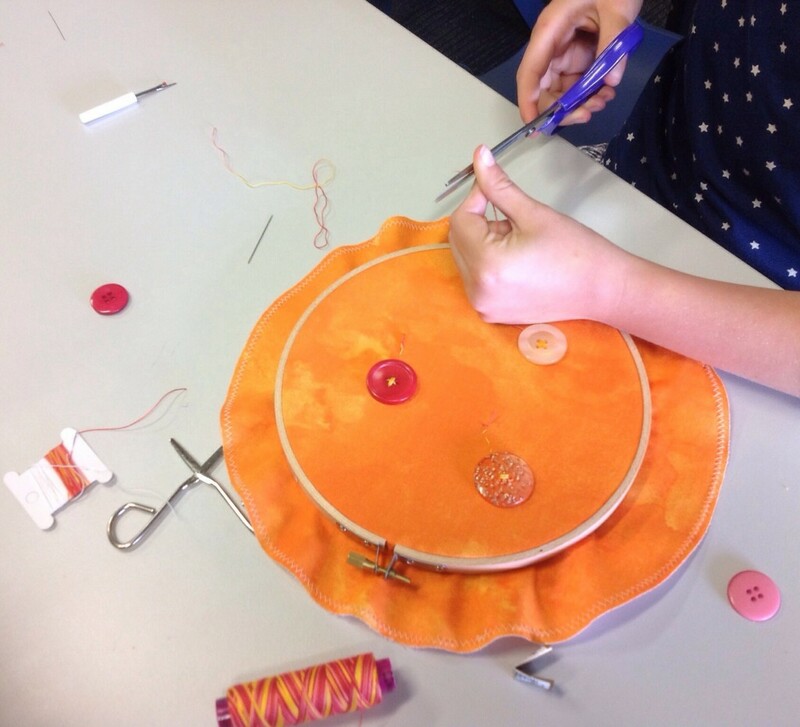 This embroidery hoop picture project also taught the children to sew on buttons securely. 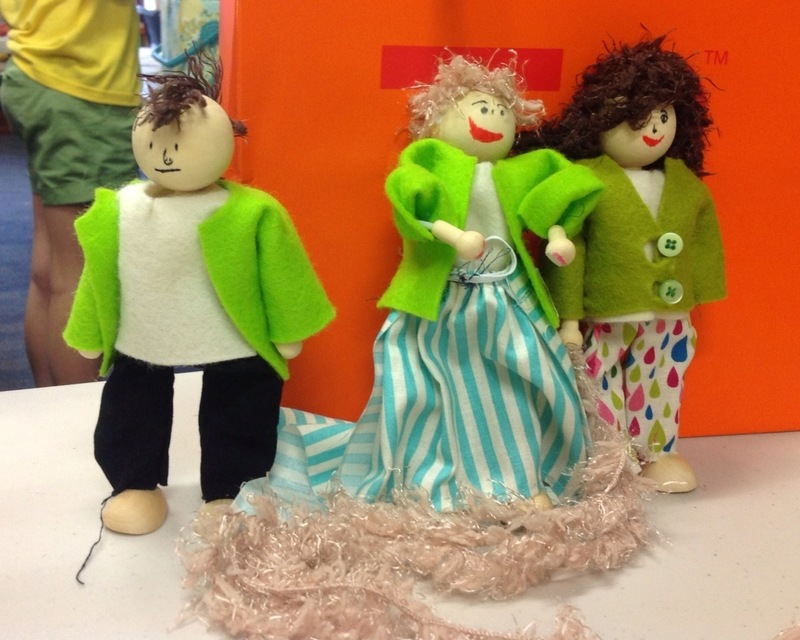 Creating clothes for wood and wire dolls. Can you spot Rapunzel? This year has seen the children’s skills improve significantly. In fact, one week I came away feeling like I hadn’t done a very good job of teaching them…. until I realised that they simply didn’t need so much input from me any more! Their skills were improving so much that I could provide materials and directions and off they went. I think that has been the most rewarding part of the whole journey for me. I could always rely on these children to freely express their creativity, but this year it was coupled with the freedom to make choices about what stitches they wanted to use for a particular task. 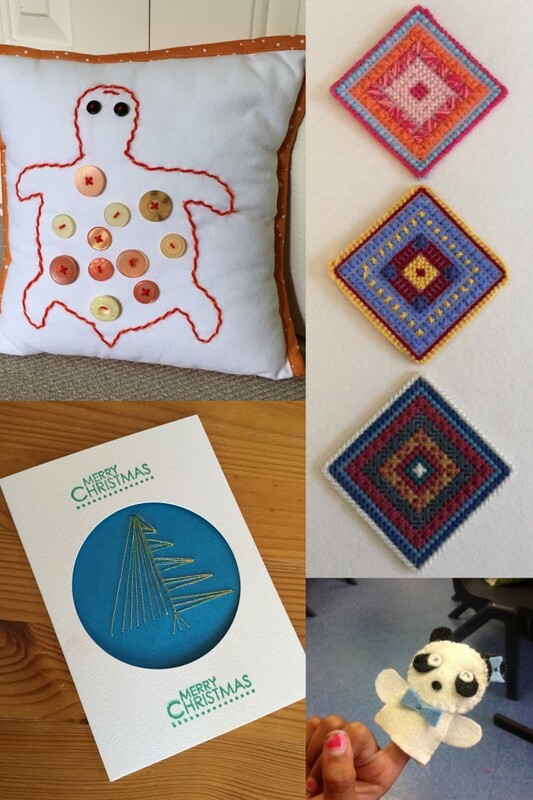 We have made cushions inspired by Namibian embroidery, coasters embroidered with wool on plastic canvas, tiny felt finger puppets and pretty Christmas cards embroidered with metallic thread. With every new project the children have impressed me with their skill and inspired me with their creativity. Some of the projects completed in 2014. Just love the turtle! I love saying thankyou and it is even better if I can find or make a small gift as a token of my appreciation. Earlier this year I bought some gorgeous fabric with pictures associated with famous cities around the world. I had planned to use it for a project with the children, but in the end we hadn’t needed it. So, I used it to make a mug rug for each child and added some tiny Christmas decorations and a special pair of tiny, sharp scissors. A thankyou gift from me to the children. It was so much fun handing these out on Sunday afternoon and having each child get excited about which city they had on their rug. And it was just a small way to say thankyou for the pleasure I have had in sharing my passion for sewing with such a lovely group of children. Don’t you love that feeling when plans start to come to fruition? When things start falling into place and you say to yourself “this just might work!”. I love it…. And I am having just that feeling as I write to you today. 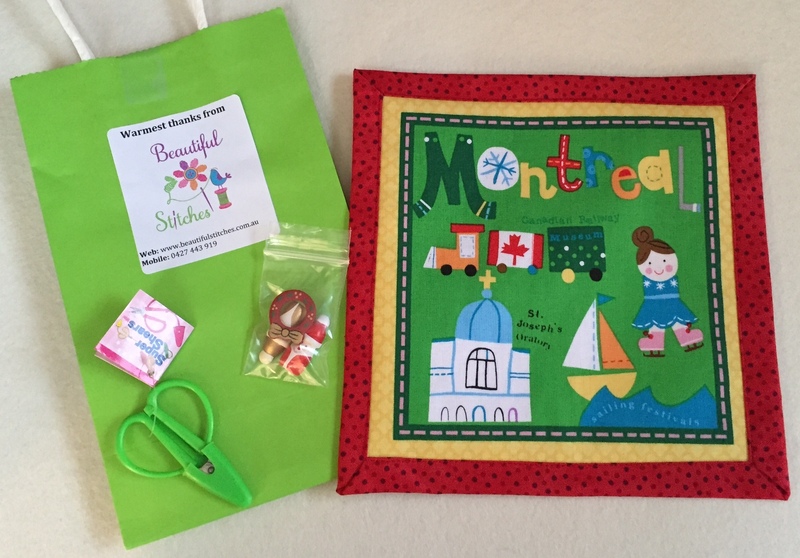 One part of Beautiful Stitches is teaching children to sew. I started with a small group of my daughter’s friends nearly two years ago. We met once a fortnight after school. The children were enthusiastic and I loved being able to share my passion for all things hand-made, and especially hand-sewn, with them. Pretty soon a second group had started and they were having just as much fun. 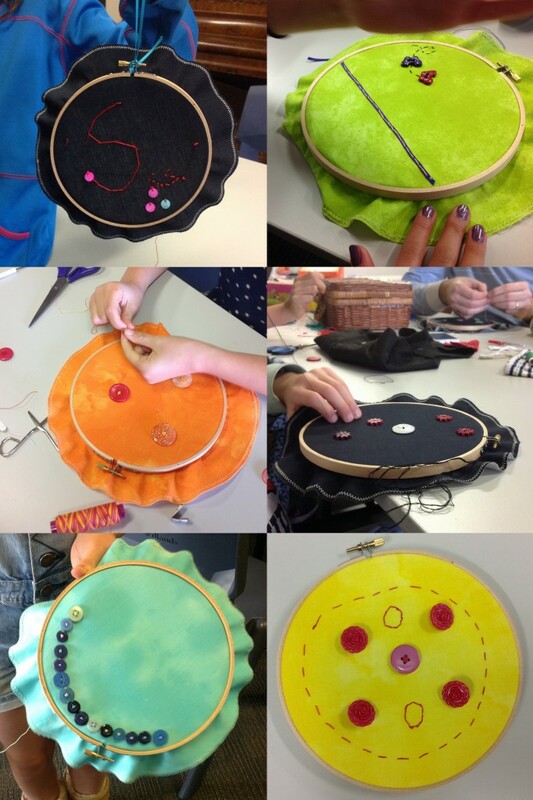 Learning to sew on buttons whilst creating an embroidery hoop wallhanging. Last year, I decided to take the whole thing onto a more businesslike footing. I hired a venue and decided to run the classes once a month on a Sunday afternoon. This gave me longer than an after school class to give the children more time to finish off a project. And once a month worked really well. The children were always eager and interested when they came to class and I was always excited to meet up with them again and start work on a new project. We took a nice long break over the long, hot, Perth summer – in my experience small hot hands and sewing are not good friends. But with the arrival of cooler weather it is time to start up again. I have a new venue and am doubling the number of classes I run – from one to two. OK, so it doesn’t sound like a big thing but it is another baby step in gradually expanding my business. I have recently started following a very cool blog by Coral called Creative Women’s Business. In a post from January this year, Coral talks about taking one step at a time – even micro-steps inch you a bit closer to your goal. And hence my great excitement. My first class is fully booked, mostly with students returning from last year. That in itself is an achievement – I am so happy that they are all keen to continue. But even better, I am taking bookings for my second class from brand new students. I received a phone call from an interested parent today and I haven’t even started advertising yet! How cool is that? I confess that I got off the phone from her and did a little dance of excitement because I just got that tingling feeling that all the painstaking plans and niggles of the last few weeks were starting to bear fruit. So, if you know of a child in Perth who might enjoy joining a sewing class with me, then please share this post so they can contact me for more information. I am just so excited that the children’s classes are underway for a third year!